As a crew man on a scallop boat in the waters off New Bedford, Mass., Nestor Franco is at sea for up to two weeks at a time -- during which he gets just a few hours of sleep per night. "After a while, all you can think about is sleep," said Franco. Fatigue is a big cause of fishing deaths. Tired fishermen may not notice things like power winches that can grab their clothing and drag them overboard. Weather, though, is the biggest enemy. Sudden storms can swamp boats and send whole crews into the sea. 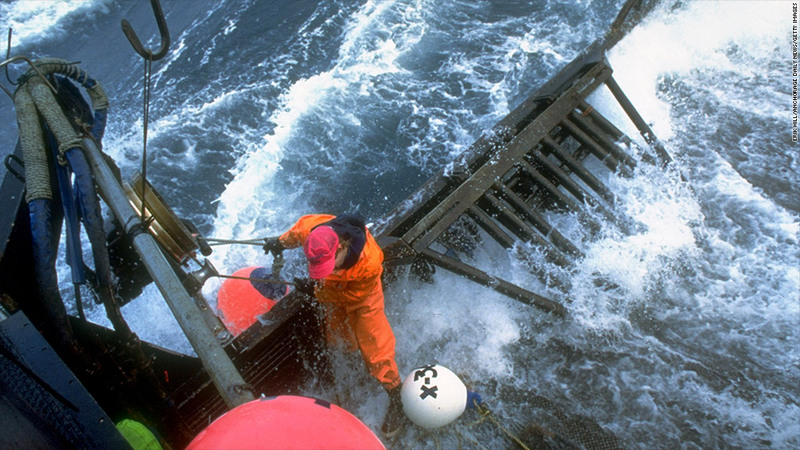 In 2013, there were 75 fatalities per 100,000 fishermen -- a 36% plunge from the year before, according to the Labor Department. A switch over to a catch share system, in which fisherman pursue quotas, has helped. No longer are fishermen rushing to catch as many fish as they can. "We're not forced out onto the water when it isn't safe," said Giuseppe Pennisi, who runs a 76-foot trawler out of Monterey, Calif. "That helps a lot." Source: Bureau of Labor Statistics Census of Fatal Occupational Injuries Summary, 2013 and Injury and National Wage Data.